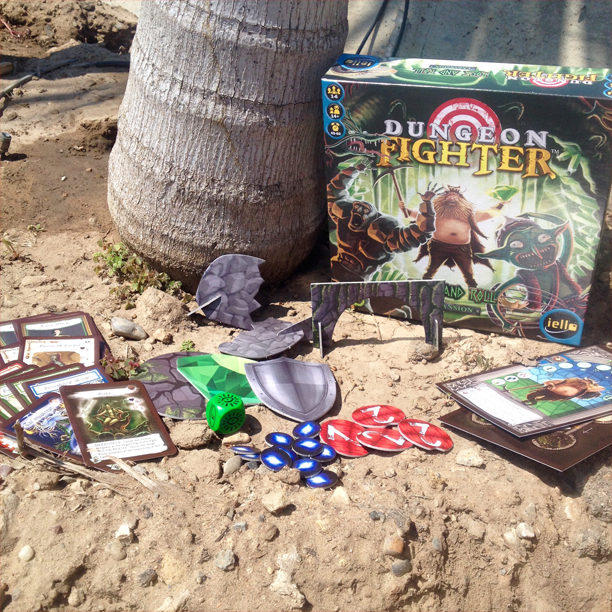 Today marks the release the fourth and final expansion to Dungeon Fighter – Rock and Roll! From the title, it’s probably no surprise to you that this expansion boasts earth, rock, and gem-themed contents. 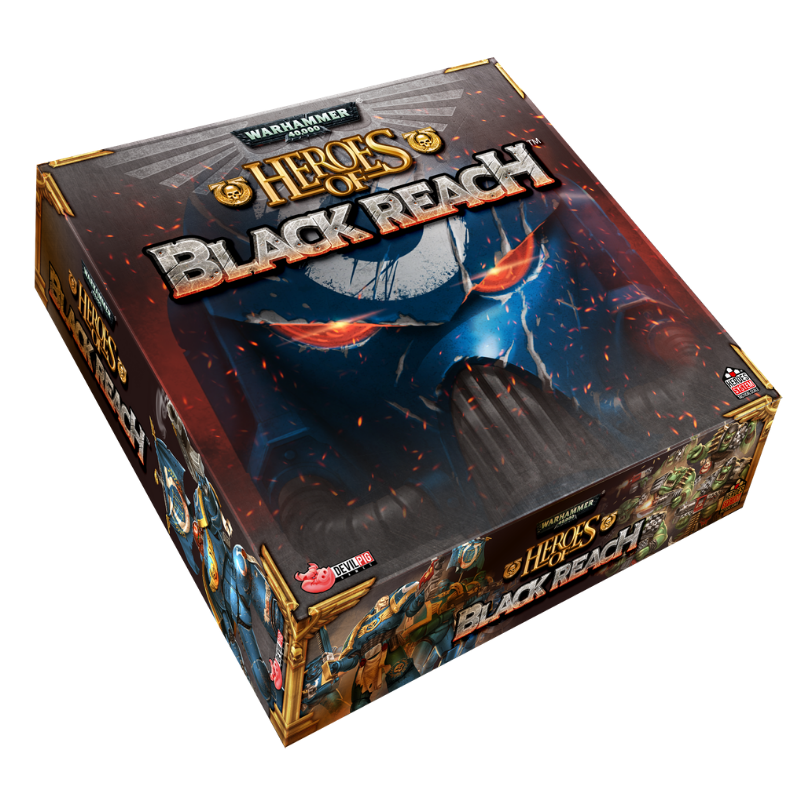 As with the other expansions, this one comes with a new hero, Tucker Blackfoot, and a new dungeon sheet (no healing springs to be seen!). Two new bosses are also introduced – Gaea, with variable strengths and weaknesses, and The Shopkeeper, who is only beatable with the combined forces of the other three expansions. You’ll also see new monsters of the fossilized, dusty, and rocky type, as well as new equipment and die with which to battle them! The new Power cards in this expansion give you the power to manipulate the various templates and tokens that are included. There are Slow tokens, which fit into the holes on the target board, and give you more chances to deal damage; the Armor template reduces damage dealt by 1 until it is hit; the Weak Point template deals 7 damage if hit, and immediately KO’s the monster if the die is activated; and finally, the Philosopher’s Stone template deals 2 damage and rewards the Heroes 3 gold each time it is hit. There are also new obstacles that affect your die rolls – the Gate and the Stone Wall. You’ll see these when battling specific monsters, or when attempting to use some of the new equipment you found. Either roll under the gate, or burst through the wall to deal damage! To get a look at this expansion in action, check out Tom Vasel’s review! Do you like dungeon crawlers? Do you like battling endless fierce creatures for the good of all humanity? Do you like doing so by throwing dice while spinning with your eyes closed, hoping to somehow hit the target? 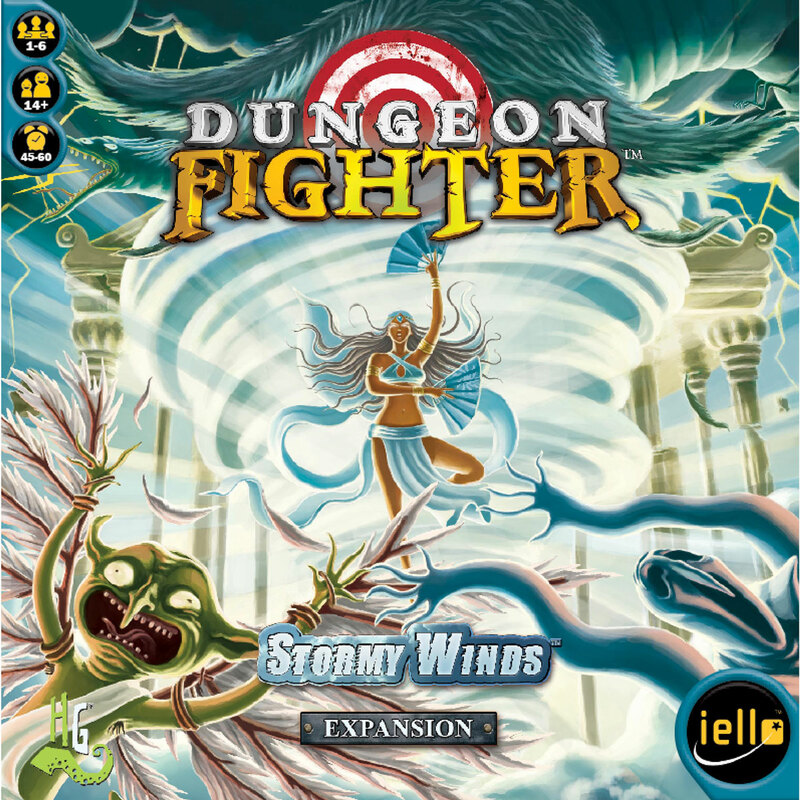 Then our new release Dungeon Fighter and its first expansion Dungeon Fighter: Stormy Winds may be the perfect fit for you! 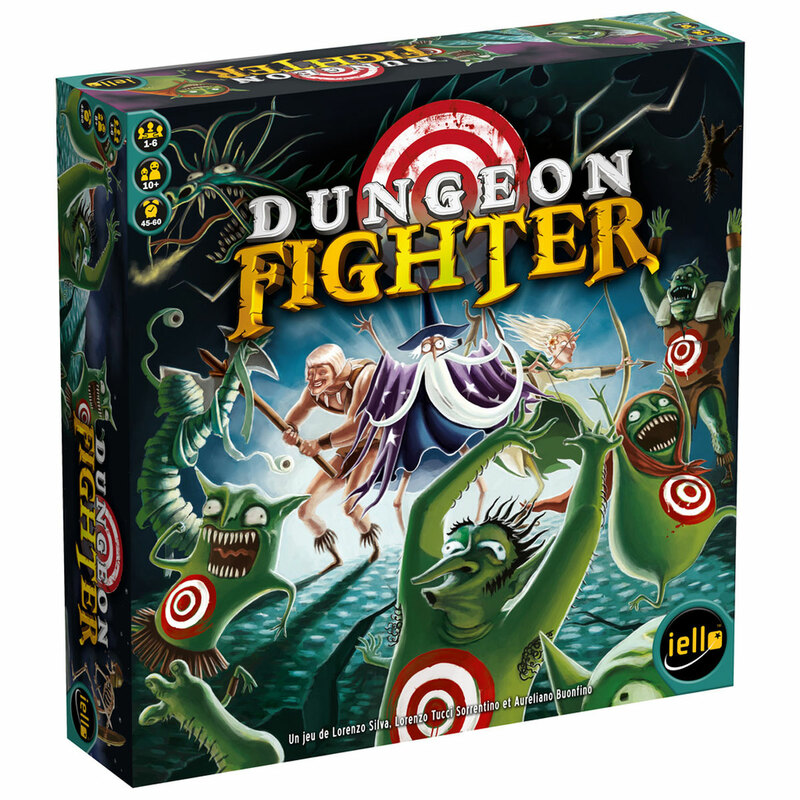 Dungeon Fighter is a fully cooperative game for 1-6 players where you brave three tiers of a dungeon, battling monsters along the way. Where this game stands apart is in its unique dexterity-based elements. 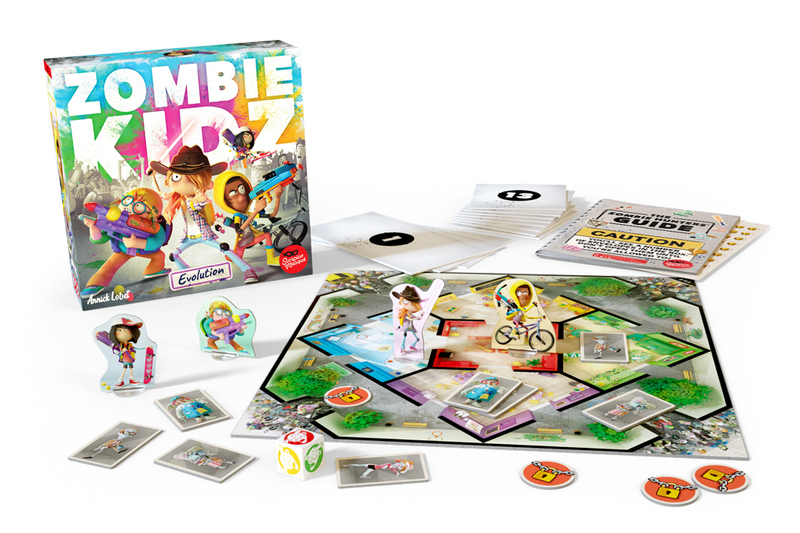 Players take turns throwing dice at a colorful target board, often from several feet away! What’s more, randomly drawn dungeon effects may dictate that a player must throw his die behind his back, with his eyes closed, under his leg, or under any combination of (often hilarious) restrictions. Keep a steady hand a clear mind, and your team with emerge victorious! Tom Vasel and his daughter Melody reviewed it – watch the video to hear their thoughts! Dungeon Fighter: Stormy Winds is the first of the four expansions for Dungeon Fighter related to the power of the four elements: fire, air, earth and water. Each expansion can be played by adding cards to the basic game or by mixing them together if you want a completely new and crazy gaming experience. This expansion contains a mixture of new game materials, but above all it gives players access to the secrets of air magic, the freshest elemental art. Now careless heroes can twist and storm everything around them to make their situation even more interesting. Here’s an overview video that shows off the components and antics of the game.